Home › SFX 2018 › Oh Ship! The past week has been filled with tons of awesome progress for team WARBRINGERS. Darshan has been hard at work creating the final lift system for our ship’s hull, Kyle has been making great strides with the masts and I’ve been devoting most of my time for this project to the texturing and painting of the hull, which I’ll be focusing on down below. 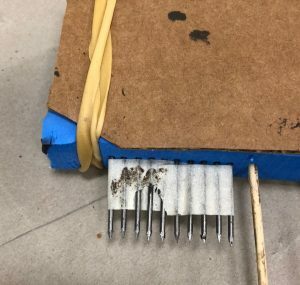 After experimenting with Jaxsan on 3D printed PLA (see last week’s blog post), we decided that it would be best to dye the Jaxsan before applying it to the hull of the ship. 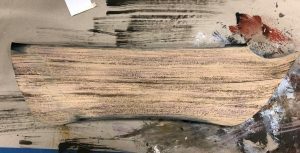 A dark raw umber paint was used to tint the product so that in the event that the paint becomes scratched, the resulting surface color wouldn’t stand out against the rest of the hull. 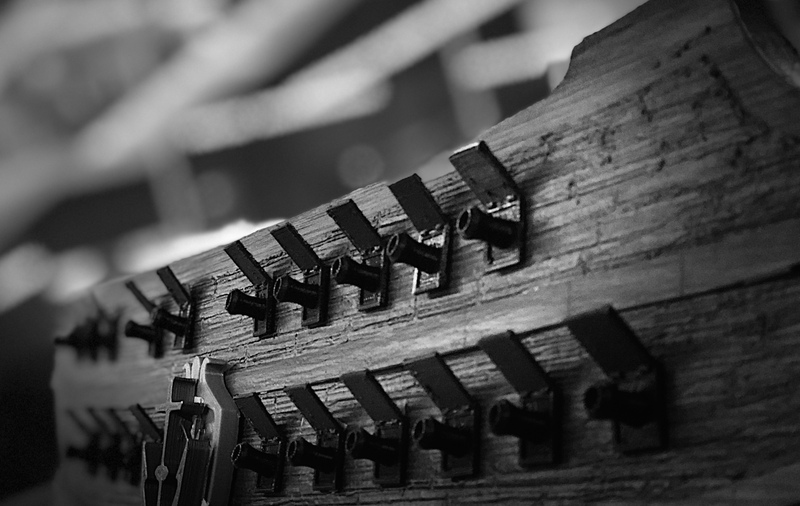 A tool was developed to draw wood plank lines across the surface of the Jaxsan. These lines were then further detailed by hand to create individual planks and nails. Plank scale was determined from a Royal Navy standard. 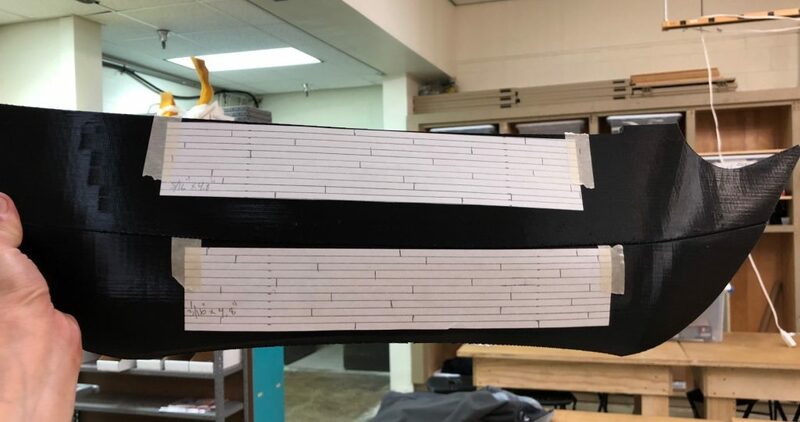 We drew the approximate size of the planks onto a sheet of paper and placed it on the hull to get an idea of how the scale would look once finished. After drying, a six-layer wood finish was painted onto the hull of the ship. Admittedly, the painting process was new to me and a bit difficult to adjust to but having gone through the process a couple of times now, I’m glad I stepped outside my comfort zone. Huge shout out to Karen and Ashton for all their advice and help with this! Once the painting of the hull was done, details such as cannons, the ship’s crest, and additional boards needed to be created. 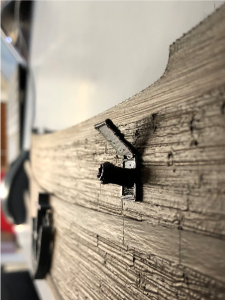 The team decided that an easy way to create detail quickly would be to treat a thin piece of material, in our case cardstock, with the same Jaxsan and paint process used on the 3D printed hull. During the Jaxsan phase of the process, I sculpted several different textures to accommodate the different types of texture we might require. I cut several beams that spanned the length of the hull. These beams divide the ship into rough quadrants and were used, along with photoshop, to determine placement of cannons on the ship’s hull. I modeled and 3D printed portholes with cannons protruding that will be painted and textured in the coming days. The intention of 3D printing the cannons is to add a sense of increased depth to the scene. Going forward, Kyle and I will be switching roles slightly. I’ll be moving away from detailing the hull and towards the troubleshooting of the mast raising system. As a result, Kyle will take over with the finishing of the hull. As of the writing of this blog post, we have a rough prototype of the raising system that looks promising going forward. Hopefully we’ll have more to share next week!